A good pair of rainboots will protect your feet from getting wet. A rain jacket will protect your body. How do you protect those more vulnerable areas that are difficult to cover? Similarly, what happens when an accident will cost you more than your individual home, auto, or other insurance will cover? This is when your personal assets and savings can be put at risk. This is when an umbrella comes in to provide protection over you and your family. Before you go out an buy a policy, take a minute to learn what you need to know about umbrella insurance. Who needs this type of policy? This guide will help you better understand umbrella insurance and who should have it. Umbrella insurance is a supplementary insurance policy used to protect your property. In general, it’s thought of as a secondary insurance policy, because you must hold a primary insurance policy for each asset, car, home, motorcycle. An Umbrella insurance policy will protect you if you cause major liability damage to another person. For example, if you get into a car accident, the medical bills to the other party may exceed your auto insurance liability coverage. That’s when umbrella insurance comes in. It will cover any excess liability damages you may encounter. It can also cover any damages that aren’t explicitly covered by your home or auto insurance policies. Property damage: What happens if your dog urinates on your neighbor’s $500,000 couch? First, you may wonder why they had such an expensive couch. Then, you find out that umbrella insurance will cover the damage. Bodily injury: The other party may accrue necessary medical expenses as a result of the accident. If someone is injured within your home, your homeowner’s policy alone may not cover all the expenses. Additionally, an umbrella policy may cover injuries not covered by your primary policy. Legal damages and fees: Legal damages come in all shapes and sizes. Depending on the case, you could end up paying for emotional trauma. This, along with legal fees, can quickly add up. In essence, umbrella insurance is there to cover any costs that may exceed your primary insurance policies. You may have separate policies for your home, automobile, watercraft, and other assets. Umbrella insurance can cover a larger array of liabilities. What’s the Total Value of Your Assets? When you’re considering an umbrella insurance policy, consider the value of your assets. Most insurers offer umbrella insurance policies in increments of $1 million. Umbrella insurance is a good choice for those who own any well-established assets. The wealthy are at a higher risk of losing their assets in a lawsuit. In a personal injury case, you could end up paying for the other party’s damaged property, medical bills, lost wages, and more. If you get caught up in a lawsuit, ensuing damages and legal fees could easily add up to well over $1 million. You could be at risk of losing all of your savings, investments, properties, and more. What if You Don’t Own Very Much? Young people and others who don’t have any well-established assets are still at risk. People are much quicker to file lawsuits than ever before. Lawyers are able to award more damages. If you have a lawsuit filed against you, you may not have the money or assets to pay for the damages. This will come out of your future earnings. You could be saying goodbye to your future. And yet, for many individuals, an umbrella policy is only a few dollars a month. If you are truly worried about your future earnings and assets, you can purchase an umbrella policy that’s well within your. 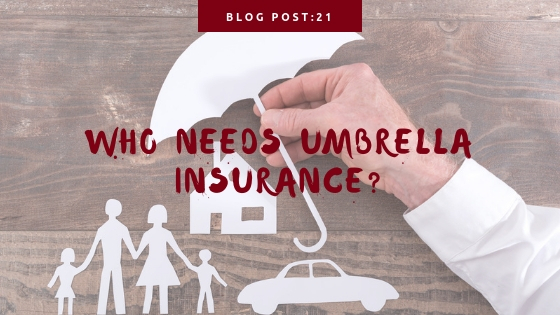 Some can cost as little as $150 a year, but Umbrella policy costs will depend on your prior claims history, number of vehicles or properties your covering, and the number of family members included in coverage. Who Needs Umbrella Insurance (Absolutely)? There are some instances where you should definitely purchase an umbrella policy. You may wish to purchase umbrella insurance if you have significant assets, usually valued over $1 million. If you own a pool, trampoline, or dog, you may be at higher risk for a lawsuit. Check with us to find out moreabout how an umbrella policy can cover these risks. Umbrella insurance is good for those who engage in high-risk activities. These are any activities that put you at higher risk of a lawsuit. Make sure all your activities are covered. Couldn’t Everyone Benefit From Umbrella Insurance? The short answer is yes. Everyone is at risk of having their assets wiped out from an expensive lawsuit. This is especially true in a more litigious society. People file lawsuits against others more freely. If the damages exceed your primary liability coverage, you could be paying out of pocket. If you don’t have the money to pay now, you could lose your assets. If your assets still don’t cover the damages, you could find yourself in debt for years to come. Umbrella insurance will protect you in the event that an accident costs you more than your primary insurance covers. With policies as low as $150 a year per $1 million in coverage, why not? In a litigious society, it seems everyone is at risk of a lawsuit. Stay protected and cover your assets. This can be a difficult question to answer. The more assets you have, the more you have to lose. However, with few assets, you may still be at risk of losing future earnings! Protect your assets and your future from predatory lawsuits. Mathenia Insurance Group, LLC is an independent agency in Missouri that works to get the best policy available to you. Contact us today to get a quote for your umbrella insurance and more.